There had, of course, been a ladies influence in the club from that very first meeting back in 1913. But it was not until 15 years later that the first meeting of the ladies club was held with Miss W. Walton taking the honour of captain. However, it should be noted that the captain's board in the ladies lounge records A. Wright in 1925 as the first person to take on the role. The officers chosen to lead the new section included Miss K. Martyn, secretary (a duty she would later share with Mrs S. J. W. Donald); Mrs R. V. Lees, treasurer; and a committee of Mrs D. Charlton, Mrs A. Gamble, Mrs S. J. W. Donald, Mrs H. S. Shacklock. The ladies were quickly into their stride, organising their monthly medals - and later arranging for a supply of special spoons to be provided by Mary's Jewellers of Nottingham as the medal prize - plus a variety of other competitions including the Searson Rose Bowl, Mrs Nesbitt's Cup and the Captain's Prize. The ladies also realised the need to start fund-raising as soon as possible, deciding to hold a tea dance in St Michael's Hall with tickets costing two shillings and sixpence. And for that half a crown, you got tea included. 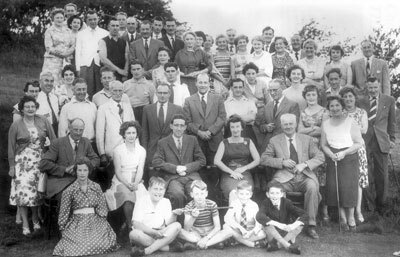 It is interesting to note that in those early years, the ladies section was small in numbers. At the 1929 AGM, it was revealed that only 12 players had taken part in the Spring meeting, only 11 competed for the Searson Rose Bowl and only 9 - due to holidays - battling for the Captain's Prize. Come the autumn meeting however, a record number of 20 players took part. It was also noted that Miss Farnsworth recorded a hole in one, winning a tea set in the process. 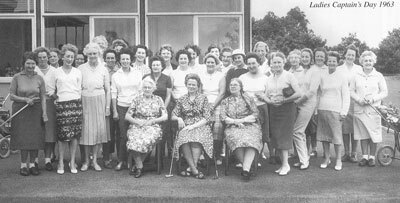 The following years were busy ones for the ladies, on and off the course. New competitions were introduced and county success was registered - in 1934, the ladies team did not lose a single match. In 1936, thanks to their diligence in the work of fund-raising, the ladies were able to provide the club with a flagpole, flag and a mowing machine. Two years later, the ladies pledged money to provide a deserved retirement present for Miss Farnsworth, the result being a handsome silver cake stand. And they put the war years to good use. Although very few competitions were held, Mrs Gregory, the captain during 1943-45 suggested that a competition should be run in aid of prisoners of war, resulting in the tidy sum of £175 being raised. A bring and buy sale held in Sutton Church Hall realised another £.65.10s. That cash was supplemented by parcels which were sent to five lads in hospital. Postal orders were sent to four soldiers in the Middle East and then a cheque for £150 was presented to the British Red Cross for the Prisoners of War Fund. Not surprisingly, at the annual general meeting of 1946, a vote of thanks to the committee, and ex-captain Mrs Gregory, was recorded, for their efforts in keeping the club going during those difficult war years. As the day dawned for the club to move into new premises, at the beginning of the 1960s, it is interesting to note discussions about furniture which are recorded in the ladies minutes. 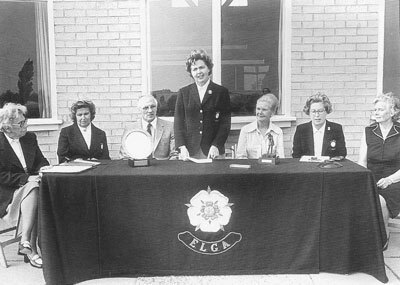 An honour for Coxmoor - the 1979 English U-23 ladies championship is hosted. One entry reveals an agreement to buy five card tables and "perhaps four easy chairs, six small tables" from Barnes the Furnishers in Sutton - at a cost of £1.16s. The minutes also add: "These were thought to be more essential than a new carpet." The secretary also made a note, in 1964's annual report, that the lady captain had been allocated a designated space in the car park. 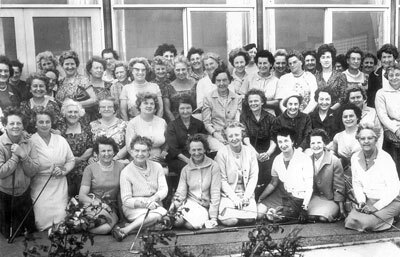 Just a few years later, in 1966, at the behest of the ladies committee, the club agreed to honour Mrs A. Godley and Mrs N. Barke with life membership to mark their years of loyal and diligent service. It was in this same year that Bill White's wife Dorothea won the Lifeboat Trophy for the first time for Coxmoor and Mrs Green won the County Veterans Cup, another first for the club. In 1968, Miss Severn announced her retirement after 27 years as secretary and she was rewarded with the presentation of an engraved silver cigarette box. She would be made an honorary member in 1969.